Sometimes when I’m in public I pretend to be a more concerned mother than I actually am. Like when Truman falls and bumps his head and the ENTIRE populace of Starbucks stops in its tracks to make sure he’s okay. And what I say out loud is, “Aw, yeah, poor guy, he hit his head!” But what I really want to say is, come on people, this happens every day, let’s not get choked up here. 2 year olds have heads made of STEEL. It was actually kind of awesome. Truman fell from a barstool and hit the back of his head going down. Before I could maneuver myself to a position where I could pick him up, an Asian man came out of nowhere and swooped Truman up in his arms, then handed him to me. I wish more strangers would do this kind of thing for each other! It was so refreshing. It reminded me of this video Eric showed me about a Japanese reality TV show that films kids as they complete their first errand. Apparently in Japan, parents start sending their kids on short errands when they are very young, like 3-5 years old. This would be impossible here in the US because 1) there are no stores close enough to walk to and 2) children are taught to mistrust adults they don’t know. It’s the opposite in Japan. Kids there are taught that they can trust adults, even if they are strangers. I think this is how the world ought to be, personally. Our culture has taken the distrust so far that I can no longer leave my sleeping son in the car for 5 minutes while I pick up some milk without worrying that someone will take a video and turn me in to the police. We were all raised not to trust each other, and so we don’t. A bystander doesn’t trust that I’m not negligent, and I don’t trust a bystander not to turn me in. It’s so sad. I would much rather teach my children that MOST people are kind and well-meaning, with a few who aren’t, instead of the other way around. So I really just love it when a random stranger (a MAN, no less, not a fellow mother-warrior) has the guts to scoop up my kid when he falls down, even if it goes against the American “mind your own business” culture. It fills me up when I see people taking care of people. Do you have any opinions about this? I’d love to hear what you think in the comments. Who loves making gravy at the last minute on Thanksgiving? I just love pulling that bird out of the oven and frantically pouring off the juices to whisk up my homemade gravy. Said no one ever! I feel like gravy is the most stressful part of the entire meal. You need the turkey juices to make it (pray there is enough! ), but you can’t get the juices until the turkey is done, and then your turkey sits getting cold while you whisk like mad over a hot stove. It’s kind of a nightmare. Enter make-ahead gravy! My mother-in-law Kris has been using this recipe for years and she just told me about it. You use turkey wings and whatever other parts you can find (neck, thighs, whatever), roast them, boil them, and then make a gravy from those drippings. Then you stick it in the freezer and forget about it until a couple hours before you want to eat. 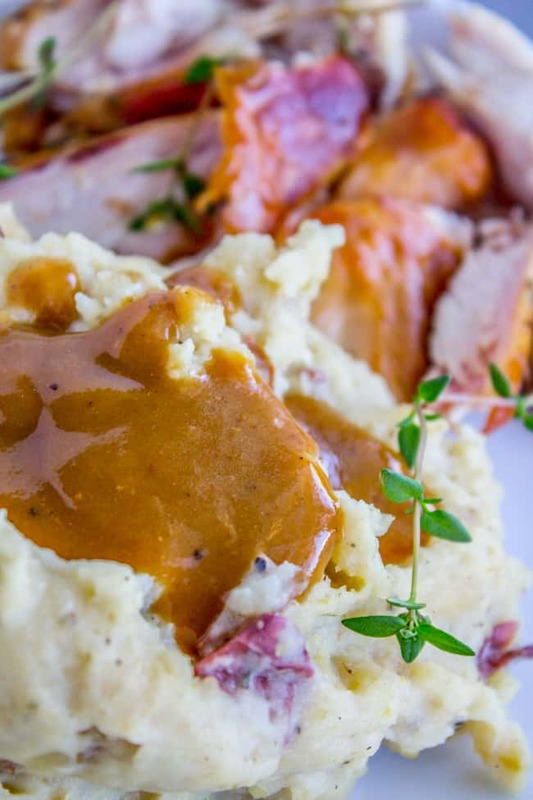 You could literally make this gravy TODAY and have one less thing to do on the big day. Mine’s already in the freezer ready to go! Place wings and other turkey parts on the pan. Scatter the onions over the pan. Roast at 400 for 1 hour, up to an hour and 15 minutes. Make sure the parts are browned on top. Remove the turkey parts to a large stock pot. Place the baking sheet over two burners on your stove and turn both of them up to medium. Add 1 cup water and use a wooden spoon to stir up all the browned bits. When the bottom of the pan is clean, scrape the water into the pot with the turkey. Add 6 cups chicken broth (or 6 cups water and 6 teaspoons turkey base.) Add the chopped carrots and the thyme. Simmer uncovered for about 1 and 1/2 hours. Pour the remaining onion and carrot mixture through a colander into a bowl. (You can discard the veggies or snack on them). Pour the broth back into the pot. Bring to a gentle boil. Whisk together the flour and 2 cups broth, making sure to get out all the lumps. Slowly whisk the flour mixture into the broth. Boil for 5 minutes, stirring. Stir in butter, pepper, and salt. Taste it and see what you think. You can add more salt, pepper, thyme, or up to 1 teaspoon of turkey base. Let cool and freeze in ziplock bags. Let the gravy thaw in the fridge overnight, or just stick it in the microwave. 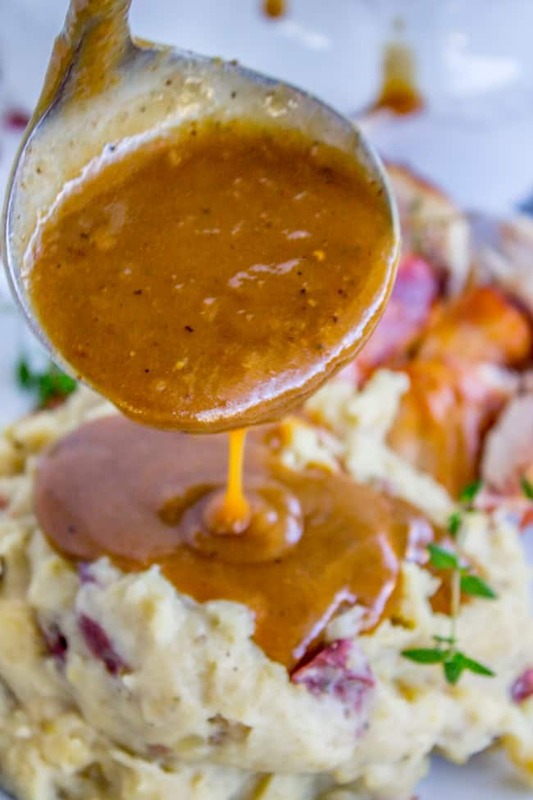 If you are making a turkey on the day you plan to serve this gravy, add the fat-skimmed pan drippings to the gravy! 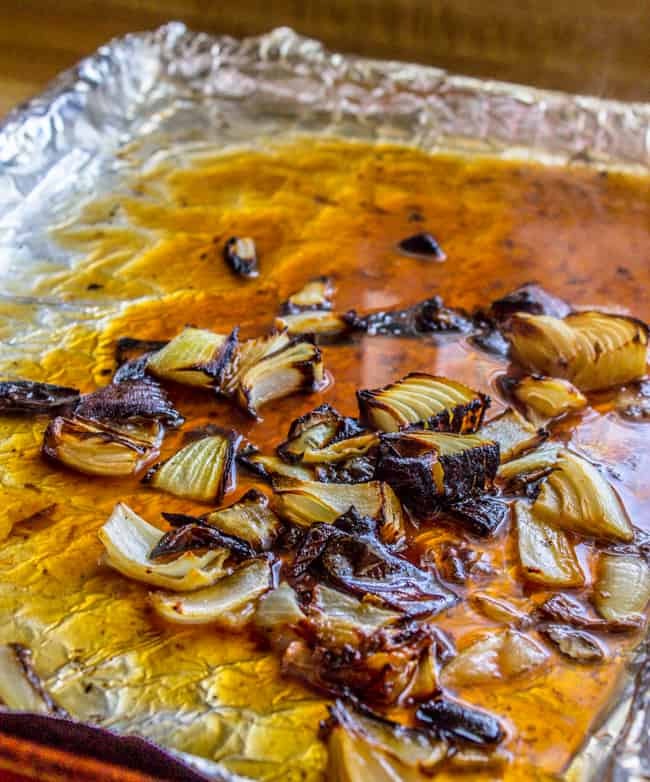 You can see in the photos that my roasting pan is lined with aluminum foil, but you don't need to worry about doing that since you want to scrape the browned bits anyway. I just did it out of habit. I used heavy duty foil and it worked out okay. *Chicken broth will work great, but to add an extra punch of flavor, I like to use Turkey Base from Better Than Bouillon. 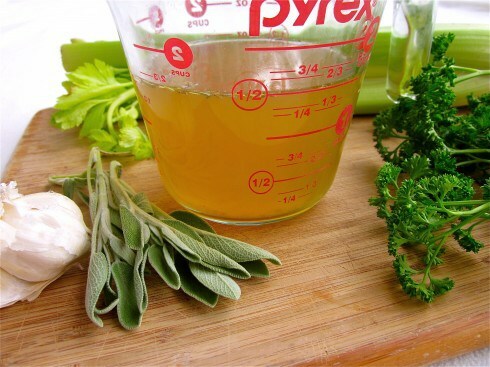 1 teaspoon + 1 cup water = 1 cup broth. It has a really rich flavor and is perfect for making a very turkey-tasting gravy. On the right is the broth after I froze it for 20 minutes. Make it easy to skim the fat. 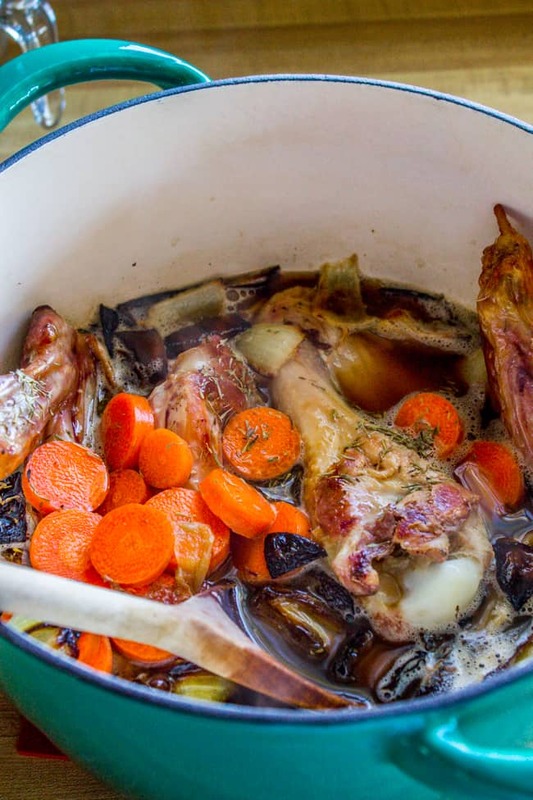 Turkey Stock from the Bones << this is so easy, such a shame if you don’t use your turkey carcass to make it! 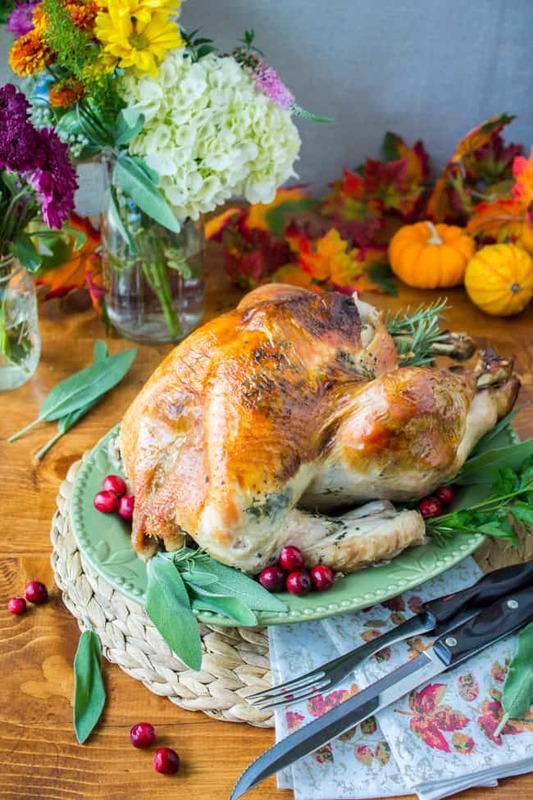 Sage Butter Roasted Turkey << I’m making this turkey again this year! Good morning, Karen. I was planning on making this gravy today but have a quick question. 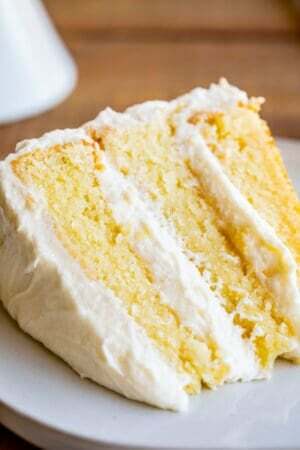 Have you ever tried using corn starch instead of flour? I need gluten-free gravy for some family members. Hi Sandi, sorry I didn’t respond to this in time. I haven’t used cornstarch but I’m sure it would work! Don’t add as much though,and be sure to stir it together with cold water before adding to the boiling broth. Thank you for sharing this recipe, as gravy is definitely a struggle every Thanksgiving. Made this gravy last nite and used 2 turkey wings & 2 thighs. I also used chicken bone broth as my grocery store was sold out of the turkey boullion. Was so easy to prepare and tasted good except seemed a little salty. Should I have used low sodium broth? Hey Lynn! 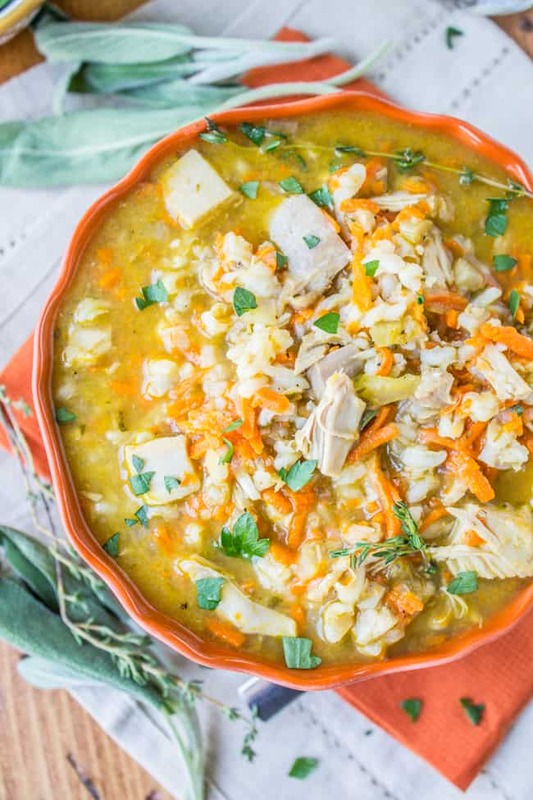 Chicken broth should work fine in this recipe. I’m surprised it was over salty. Next time you could try low sodium, that would help, and also cut the sale called for in the recipe. What brand bouillon did you use? I recommend Better Than Bouillon. Cheaper brands tend to be more salty. First, I love you and your column. You have gifted me with so many belly laughs. I think I like your commentary more than the recipes (well, maybe it’s a toss-up). It was nice to read of a stranger’s kindness to your son. One thought did pop into my mind though, won’t it be nice when we get to a place in our world where we don’t even think to mention someone’s ethnicity when we tell a story? I will try this approach to TD gravy. I always have such a mess in the kitchen about that time that skipping the gravy making would be wonderful. Happy Holidays to you and your family. Thank you so much Delia! It fills my heart to know that you are loving my blog, both the stories and the recipes! Thank you for letting me know. Happy holidays to you too, and I hope you love the gravy! It’s a life saver! THANK YOU so very much for all of your recipes! I’ll be making the gravy soon! You’re the BEST! Thank YOU for reading Sasha! I know you are going to love this gravy. 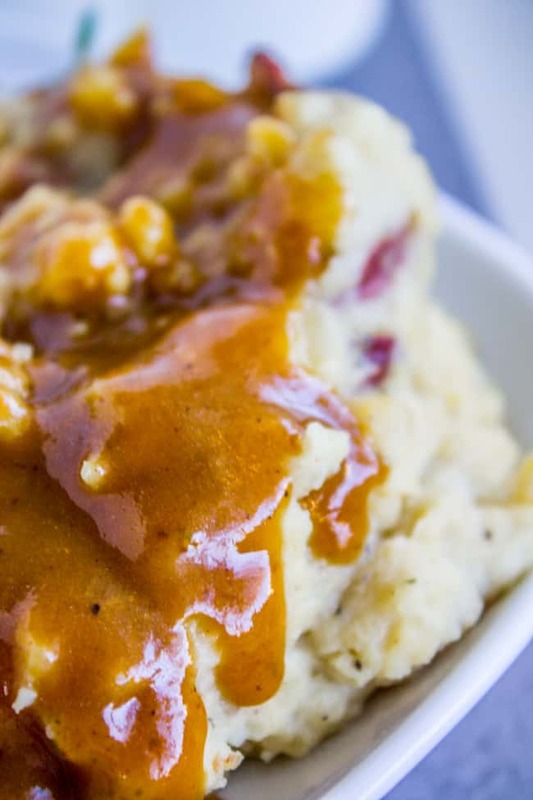 Anything that saves you from that last minute Thanksgiving dinner gravy rush is a winner! Okay, just finished making this gravy in prep for the big day tomorrow. It’s so delicious! I’ve never made homemade gravy before so I wasn’t sure I could pull it off. I’m so happy to report that it was easy and SO worth it! Both my husband and I agree that it’s by far the best turkey gravy we’ve ever had. 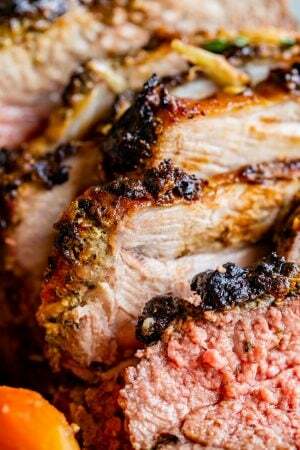 We’ll just add a touch of the drippings from the turkey tomorrow and it’ll be beyond amazing. Thank you so much! This gravy looks delicious. I have gluten and dairy intolerances, any suggestions on how I can modify it? Thanks! Hey Sara! You can leave out the butter no problem. It will be fine. As for the flour, I would try using cornstarch but not as much. Start with 3 tablespoons and move up from there. Make sure you always mix cornstarch with a little COLD water (or broth) before adding to the hot gravy on the stove, otherwise it will clump on you. I hope this works out for you Sara! let me know how it goes! 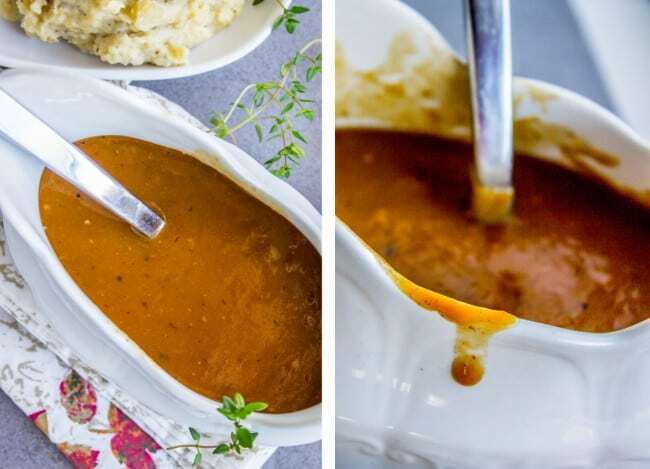 Made this gravy last year and it was a huge hit! Making it today for next week–I was thinking of using white wine to scrape up all the yummies from the baking sheet. What do you think??? Ooh that would definitely add another layer of flavor Mary! Yum! My husband is frying a couple of turkeys so no drippings. I’m going to try this and freeze it. The pictures look like it’s nice and dark brown which is the way I like it. Yes, it is a very nice and rich color! Fried turkey sounds so delicious! Hope you enjoy the gravy! I’m so happy to hear that Chrystal! Thanks for coming back to review the recipe, I so appreciate it! Karen, this recipe for make ahead turkey gravy looks like it is going to be a lifesaver! I would like to print it but I don’t see a print button. Am I missing it? Is three weeks in advance bad? Or should I make it and freeze it closer to Thanksgiving? Hey Carmen! Yes, totally make it right now, but I would freeze it. Then pop it in the fridge a couple days before eating. If you just refrigerate it for 3 weeks it will turn on you. Hope you enjoy! Happy Thanksgiving!! I made this last year and putting it right back on the menu this Thanksgiving. This gravy is superb! I made mine several days early, reheated on Thanksgiving and enjoyed no stress of making the gravy while all of the other food waited. Thanks for the recipe! I’m so happy to hear it was a success Wendy! I’m about to make mine soon for Thanksgiving too! Thanks for the review!! I’ve been making my gravy like that for years too. I too use Better Than Boullion stock. Just a tip – after you’ve boiled your wings etc., strain the broth through a clean linen tea towel. It collects the bits as well as the fat. Then you’re ready to go. Since I’m 72 this year and we can’t lift the whole turkey into the oven, I’m doing it in two stages. First day – legs, thighs, back and wings and make gravy Refrigerate the legs and thighs till dinner. 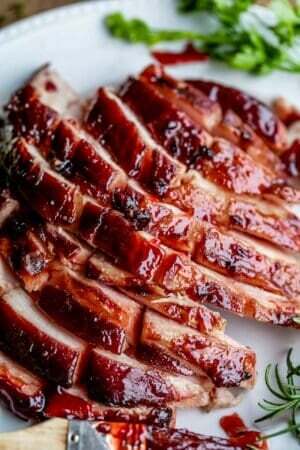 Day of – roast the breast and reheat the dark meat. Gravy is ready, kids have to bring potatoes and veg. Make stuffing balls the day before and reheat with dark meat. Lovely Food. Thank yours for sharing. Thanks Karen. so very much for all of your recipes! I’ll be making the gravy soon! You’re the BEST! Thanks so much Sabrina! How did the gravy go?? So yummy! Thank you for sharing. I cannot wait to use this Thursday! We are making up a batch today too Julia! Happy Thanksgiving! Seeing if someone is ok when they fall or get hurt is just common courtesy. We complain when we see people indifferent to others suffering and yet we don’t even offer it to our own in the most basic of ways. Truly sad. No need to run over hysterically, but a “yo, dude, that was quite the tumble. Are you ok?” seems like the right and considerate thing to do. It has been proven that we are born with a certain amount of empathy when we are born (eg when one baby cries other babies join in), but then how we are raised determines whether our level of empathy increases or decreases. Yay I’m glad you’re trying it out Susan, let me know how the gravy turns out! 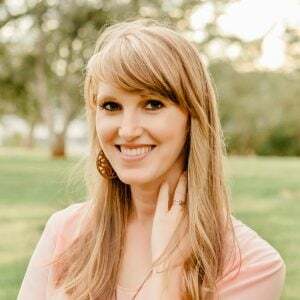 Since writing this post last year, a cousin of mine took a job in Tokyo with her family and she has mentioned the same thing that your son noticed. The culture is just different there. I’m jealous! The American culture of distrust makes me sad. Just wanted to get back and say that, for the first time in my almost 50 years of making turkey dinners, we had plenty of gravy – AND, it was delicious! Thank you! With only two of us this year I roasted just a turkey breast,, so there were almost no drippings. It would’ve been impossible to make any gravy. I also made extra of the sides and we ate Thanksgiving dinner for four nights in a row, just because it was so good. There was enough gravy to cover the meat and the mashed potatoes, and I have some in the freezer. So good and so easy, and I loved that all I had to do was get it out and warm it up! SUCCESS! Seriously, not having enough gravy is such a tragedy. I’m so glad you liked it Susan! Thanks for sharing your review! It’s sad, really, how little we trust one another, how scared we are of our surroundings, how much we worry. It would be kind of awesome if Truman or Charlotte could run their little legs down to the store for those eggs or milk you didn’t realize you ran out of before starting a recipe (I hate to admit how often I do that). Love this gravy! Have a great holiday. I totally agree with you! It’s sad how no one looks at each other or talks to each other or even smiles anymore. Society is a little out of control! LOVE make ahead gravy! Funny you should mention this. At my son’s 4 year check up the dr told me that it was time to start teaching him stranger danger. I think it’s good kids to be aware but at the am time I’m having trouble telling him to be wary of everyone. I mean I smile and say hi to people while we’re out. So do I need to stop doing that too so he learns from me? Last year I made my gravy ahead for the first time and it was the best! This recipe looks wonderful!! And I agree – we definitely live in a VERY mistrusting culture these days. Kinda sad. 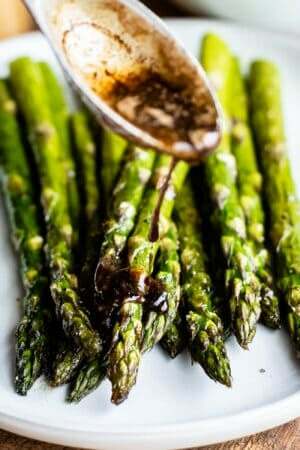 I love this make ahead gravy! Gravy is the one thing I struggle with every Thanksgiving. So glad to have this recipe so I don’t have to stress on the big day! This looks like perfect gravy! And yes! Christian falls down all the time at church and I just kind of stand there while everyone flocks to him. LOL!